Come late fall into early winter, Northern Fulmars start to appear on Pacific Northwest outer coast beaches. The #2 species in COASST, this denizen of Alaska is virtually absent from the Lower 48 during the spring-summer breeding season. And that’s because they are busy on colonies from Gareloi Island in the Western Aleutian Islands to St. Matthew Island in the northern Bering Sea. Fully ~1,250,000 are thought to breed in Alaska, mostly on offshore islands with steep cliffs where they scrape out a shallow depression to lay their eggs. 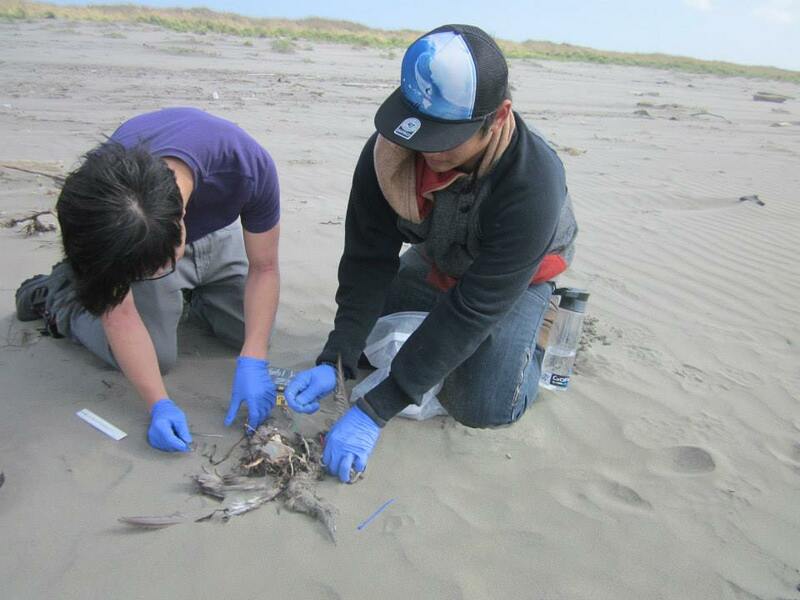 The pulse of fulmar on Alaska beaches is actually during the breeding season! But once that season has ended, adults and young-of-the year alike take off for points south. Well, at least that’s the usual pattern. In the 2017-18 winter, fulmars were notably absent from Lower 48 beaches. What’s weirder, they suddenly appeared in late winter-spring. 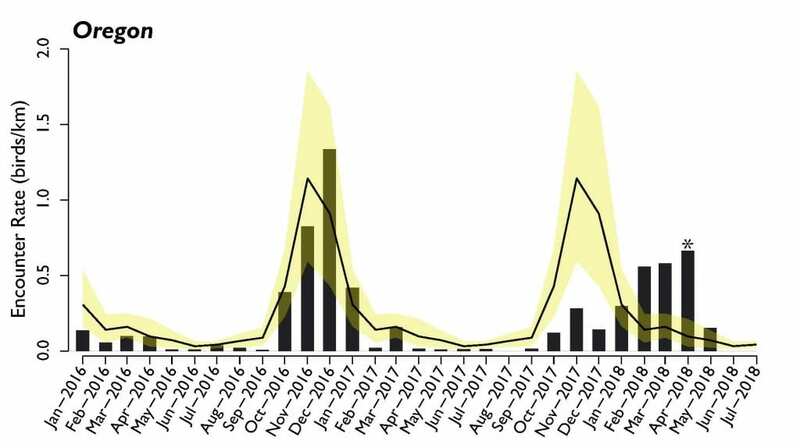 In late April, usually the quietest time of year for COASSTers, Jane and Makenzie found 14 Northern Fulmars on their survey of Nye South near Newport in Oregon. Charlie, COASST’s stalwart verifier, noted that across Oregon beaches, not only were there more fulmars than usual, but many of them were light morph birds. At first glance, fulmars are boring-looking birds. No difference in plumage between adults and immatures, breeders and nonbreeders, or males and females. But the traditional plumage differences in birds just doesn’t tell the story of fulmars. These birds have two different plumage patterns, which appear to map onto where they breed. So called “dark morph” birds, resembling their Tubenose relatives the shearwaters (but note the stocky, pale bill of the fulmars! ), principally breed in southern Alaska. Light morph birds, resembling gulls (but note the telltale plates on their Tubenose bill versus the smooth, featureless bill of the gulls), breed farther north, in the Bering, Chukchi and Arctic. What’s cool about this difference is that COASST can get a sense of where fulmars are coming from based on their plumage. Most Lower 48 COASSTers find the dark morph. Light morph birds do wash up where they breed during the breeding season, and then migrate down the “other side” of the ocean towards Japan, Taiwan and Korea. But not in 2017-18. In fact, turns out light morphs have graced Lower 48 beaches in previous years, most notably in 2008 and 2009. 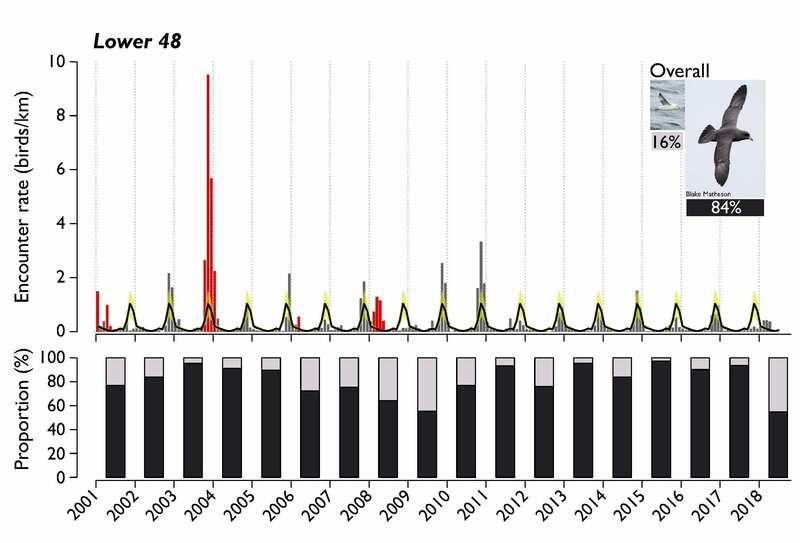 Some years – like 2009 and 2018 – have no fulmars during the usual peak, but display a peak in the following spring, whereas other years – like 2006 and 2008 – have a double pulse: once when they’re supposed to arrive, and a second spring peak. 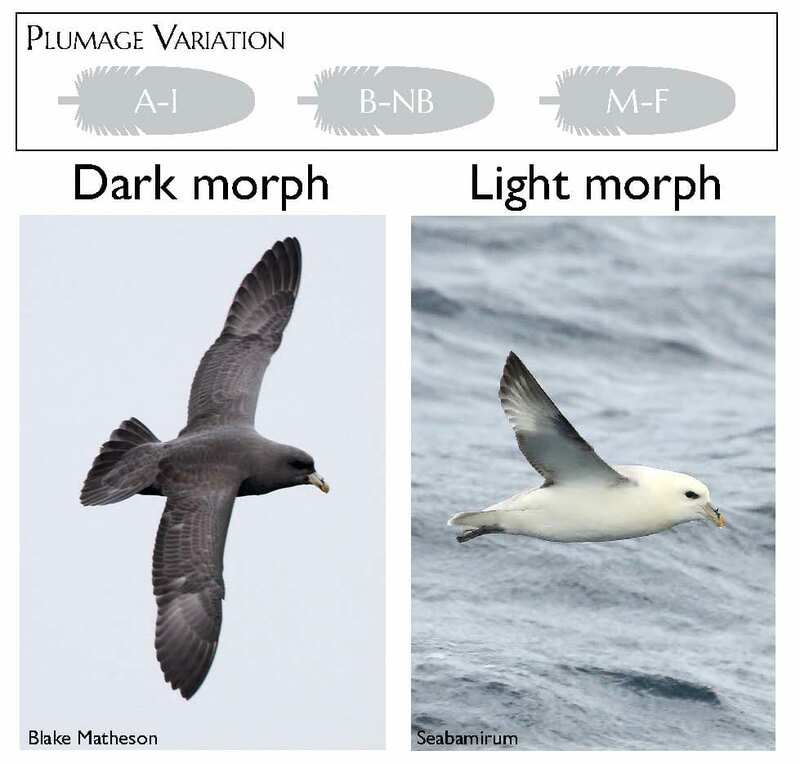 Guess which morph arrives in the spring … in both 2008 and 2018, the ratio of light morph fulmars was much higher than usual. Of course the vast majority of fulmars found on Lower 48 beaches are dark morphs, occasionally loads of them, as was the case in 2003/2004. Since COASST discovered this “light-spring” pattern, we’ve been wondering about it. Who are these guys? And where are they coming from? Given the spring migration timing, it would seem that these birds are actually on the way back north to begin the breeding cycle. So, do light morphs occasionally migrate up the eastern side of the ocean? Or do they always do that, and only sometimes wash ashore? And would that be a weather signal? An ocean circulation signal? A climate signal? Or… We remain mystified! 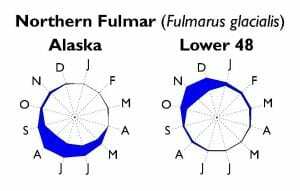 What’s your prediction as we head into the 2019 fulmar season: dark morphs in winter, or light morphs in spring? 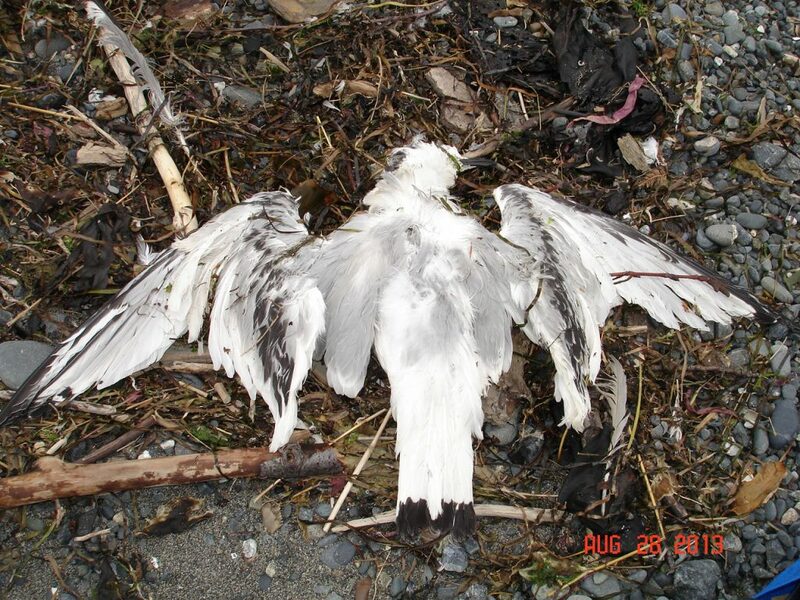 This entry was posted in Beached Birds, Uncategorized and tagged fulmar, Seabird, Tubenoses on August 28, 2018 by coasst. A recent spate of Black-footed Albatross finds along the north outer coast of Washington in May and June got us wondering about these majestic birds. With a wingspan of two meters (!) or longer, albatross are the largest members of the Tubenose Foot-type Family (Procellariidae). In the North Pacific there are three species: the dark-bodied, dark-billed Black-footed Albatross; the light-bodied, Laysan Albatross with a “smokey eye”; and the larger, Short-tailed Albatross, distinguished from Laysan and Black-foots by an over-sized bubblegum pink bill (plumage of Short-tails varies with age). What else might a COASSTer mistake an albatross for? Bald Eagles, Brown Pelicans, Great-blue Herons and Sandhill Cranes are all COASST finds with overlapping wingspans. But each of these birds can easily be distinguished by foot-type, and bill size and shape. All of these large-bodied COASST finds have distinctively different feet. A long-lived, monogamous bird, albatross begin breeding at age 5-10, and it takes two parents to raise a single chick. New pairs may require a few years of practice to “get it right. 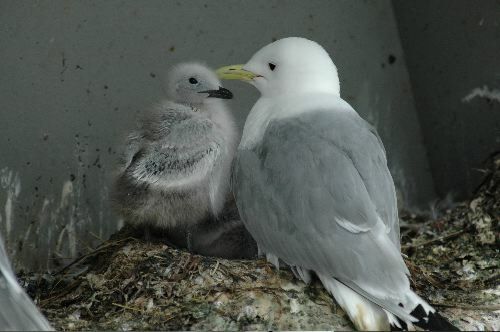 After that, mates meet annually for a long breeding season: courtship and “re-acquaintance time” starts in November, eggs appear before the turn of the year, and chicks don’t fledge until mid-summer! Like all members of the family, albatross have a keen sense of smell and can literally smell their prey from tens of kilometers away, a talent that suits these open ocean birds. Dinner for an albatross? Neon flying squid, flying fish eggs (tobiko in sushi restaurants), and a range of small fish and shrimp-like organisms that come to the surface of the ocean at night. Unfortunately, smelling their way to food puts albatross in harm’s way. Fishing vessels smell like floating restaurants, attracting albatross and their smaller relatives – shearwaters and Northern Fulmars – some of which become entangled or hooked in gear. Marine debris can also be deceptively appealing, as some plastics, after floating in the marine environment, adsorb and emit the same chemical (dimethyl sulfide) used by procellariiforms as a cue to identify prey. Not only that, floating debris can look like albatross prey (could you tell the difference between a squid mantle and a red lighter floating at the surface?). Young birds are especially susceptible. Dependent on their misled parents for food, chicks ingest plastics, filling their stomachs with indigestible objects they cannot regurgitate. Photo: Claude Gascon. One theory to explain why albatross consume marine debris is prey mimicry. Oblong, ~5cm floating objects in the yellow to red color spectrum are squid mantle look-alikes. Populations of Black-foots and Laysans number in the hundreds of thousands. In contrast, Short-tails number less than ten thousand and are listed as “vulnerable” on the IUCN Red List (International Union for Conservation of Nature). With a body that mimics a glider, albatross have the ability to soar tremendous distances. Even while breeding on islands in the Hawaiian Island chain (Laysan and Black-foots) or southern Japan (Short-tails), breeding adults regularly visit North American waters. Laysan’s appear to prefer coastal Alaska, whereas Black-foots fly due west to the Lower 48. Breeding so far from our shores, and preferring the open ocean, you might think COASSTers would never find an albatross. Not so! In fact, Black-foots are among our top 30 species. 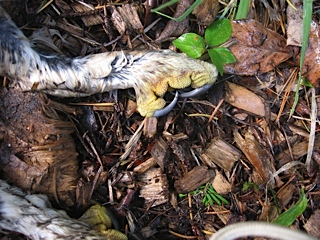 Peak Black-foot deposition is in the summer: May through August, just when adults are finishing breeding and chicks are coming off the colonies. But the annual pattern is “irruptive.” That is, in some years COASSTers are much more apt to find an albatross than in others. In northern Washington, 2012 and 2017 were break-out years; in southern Washington, 2003, 2007 and 2012 were big. The good news is that there doesn’t seem to be any trend towards higher numbers. 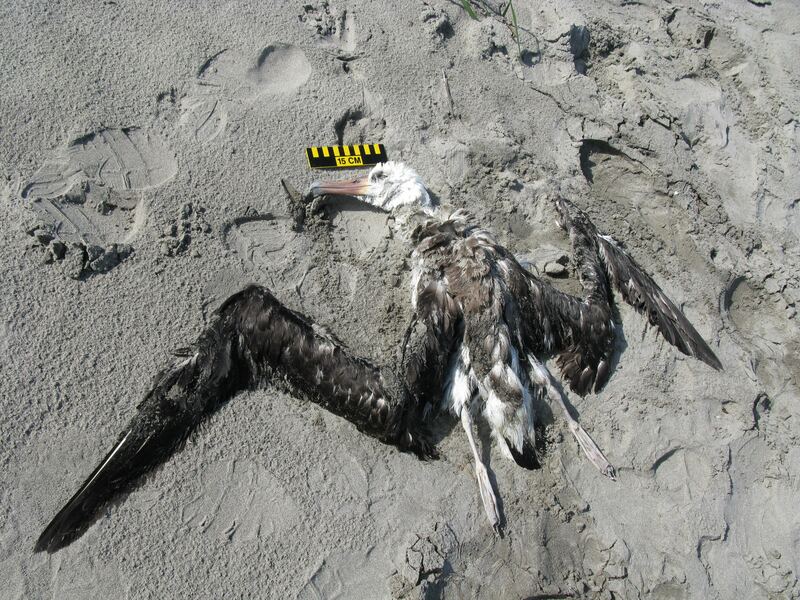 Although you’d have to walk pretty far, on average, to find an albatross on the beach, they do wash up regularly. Along the West Coast, Black-foots are about three times more prevalent on Washington outer coast beaches than along beaches to the south in Oregon and California. And Laysans are a truly rare find (photos are scaled to encounter rate). On the Aleutian Islands, the opposite is true. 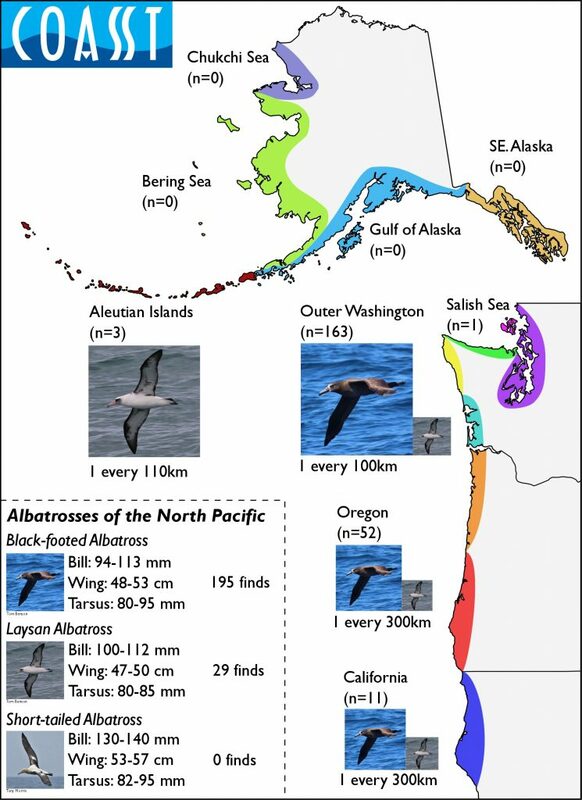 Across the COASST dataset, albatross species wash up exactly where you would expect them to given at-sea sightings: Black-foots along the West Coast, and Laysan along the Aleutian Islands in Alaska. Although the total body count favors the lower 48 (note only 3 Laysan have been found in Alaska), it’s actually the encounter rate (carcasses per kilometer) that is important. Remember, there are many more COASSTers along the outer coast of Washington, Oregon and California than there are in the Aleutian Islands! 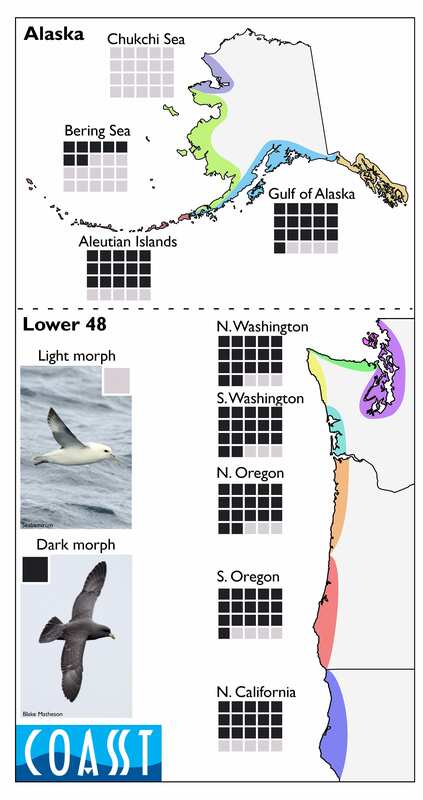 The photographs in the figure above are scaled to species-specific encounter rate the—the chance of finding an albatross in the Aleutians is about the same as along the outer coast of Washington. A closer look at Black-foot deposition pattern on the West Coast reveals two distinct aggregations: one associated with the entrance of the Strait of Juan de Fuca (we’re guessing these birds are associated with the Juan de Fuca eddy – an oceanographic feature south of the Strait), and a second larger aggregation surrounding the Columbia River. 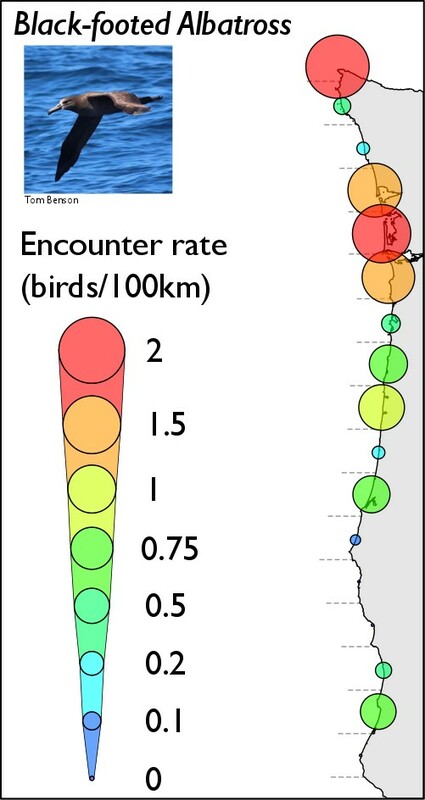 Both the eddy and the “plume” of river water exiting the Columbia River into the Pacific Ocean are highly productive locations where a hungry chick or exhausted post-breeding adult can hunt pelagic prey. When Black-foot encounter rates are broken down into smaller lengths of coastline (half a degree of latitude, or about 55 kilometers), it’s clear that some locations attract many more. Moral of this story? If you hope to see an albatross on a COASST survey, head to the south outer coast of Washington during the summer and take a stroll along the sand. 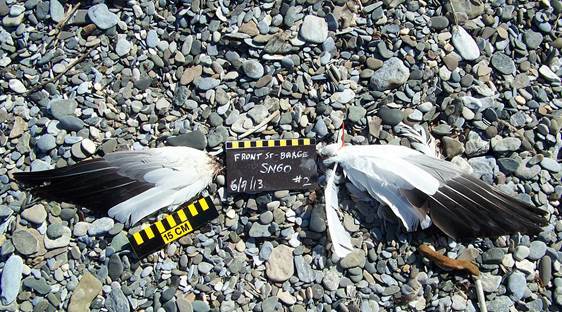 This entry was posted in Beached Birds, Marine Debris and tagged albatross, Marine Debris, Tubenoses on September 8, 2017 by coasst. Fall is here and the Common Murres are hitting the beach. We’ve been receiving lots of surveys with lots birds! This is nothing out of the ordinary for this time of year, but you should expect longer and “birdier” surveys than your usual. Make sure to start early and bring a snack. Now is also a good time to check your cable tie supply to see if you’re running low of any color. A Laysan Albatross found by Kathy on the South Coast (WA). 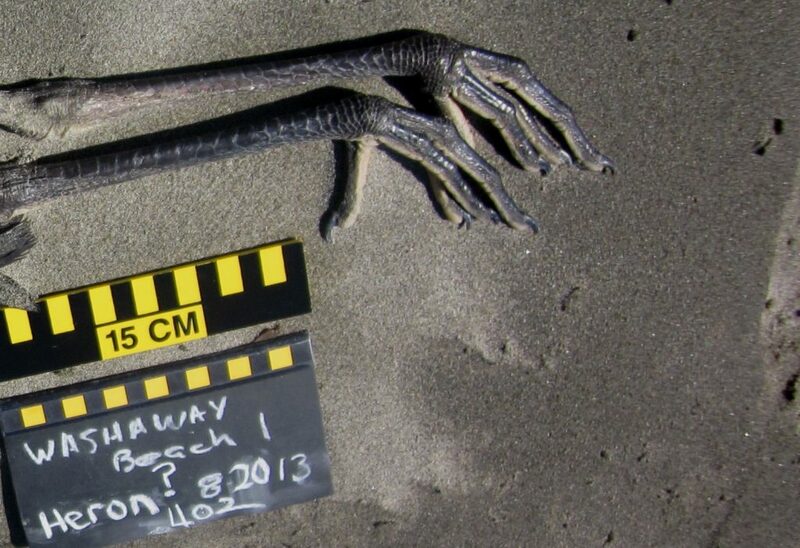 Those three-webbed toes and huge foot (tarsus >75mm) point us to the Tubenose: Albatross family. From here we have three species to consider: Black-footed Albatross, Laysan Albatross, and Short-tailed Albatross. The bill length is WAY smaller than a STAL (130-140mm), and the pale bill and feet rule out BFAL, we’re left with the Laysan Albatross. A Green-winged Teal found by Susie and Bill in Oregon North – time for some more wing practice! Using the wing table, at 17cm, the wing falls into the tiny (wing chord <18cm) row but because it’s right on the edge, let’s also consider small (18-20cm) row. That area of contrasting color in the secondaries puts us in the Patch/Speculum group, giving us four options in the two rows; BUFF (WF15), HOGR (GR6), PIGU (AL10) or GWTE (WF7). Bufflehead, Horned Grebe and Pigeon Guillemot have a white patch on the upperwing – not a match. But the green and black speculum with buffy bar in front and white behind is a perfect match for the Green-winged Teal. Using the west coast wing key, we’d select “secondaries contrasting and dark” for the first question sending us to Q18. Here, we’d select “green, w/ tan strip above and white below.” With a wing chord of 17 cm, we have a Green-winged Teal. Using the Alaska wing key, we’d select “w/ light or dark speculum and/or one or more white patches” sending us to Q17. Here, we’d choose “dark speculum, no patch” leading to Q24. The “green w/buffy stripe above and white below” points us to the Green-winged Teal (a little short for Alaska birds, but that’s okay – this find is from Oregon). A Mottled Petrel found by Sue and Scott on the North Coast. You won’t find a species page on this bird in the COASST field guides, but you can still get pretty far on the ID. The three webbed toes with a small fourth toe and flat heel (not quite visible in the photo) would take you to the Tubenoses:Petrels family. 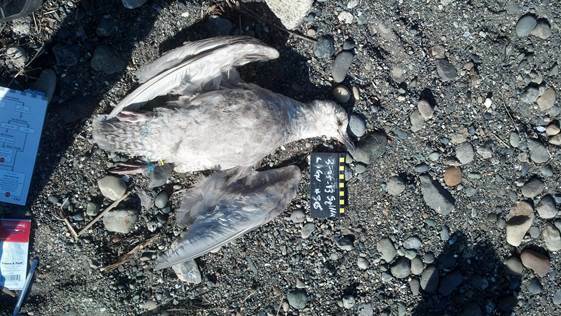 Using the west coast guide, a wing chord of 25cm puts this in the True Petrels group. From here, we consider the bill shape, tarsus, and bill color: thick and short (bill), round (tarsus), and black (bill color) – group: Gadlfy Petrels. With this guide, we can’t get any more specific than the subgroup of Gadfly Petrels. 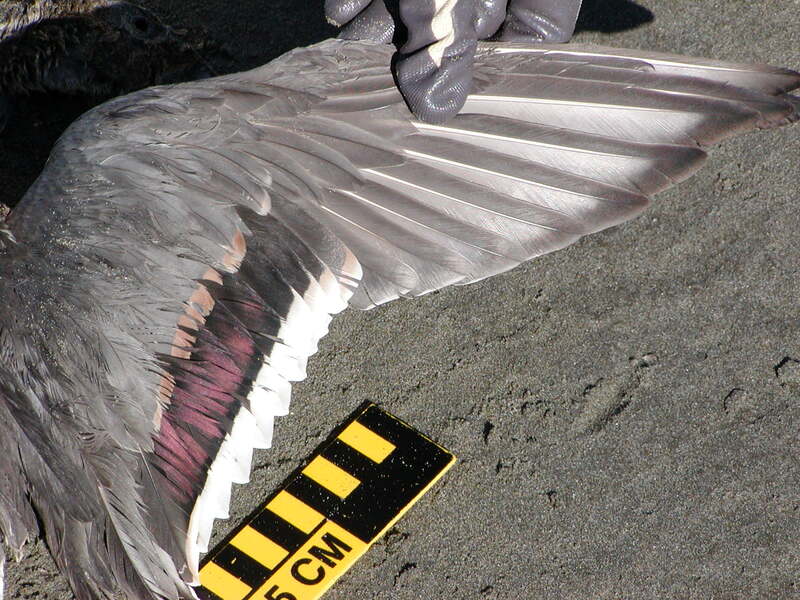 Using the Alaska guide, a wing chord of 25cm puts drops us into the True Petrels group. 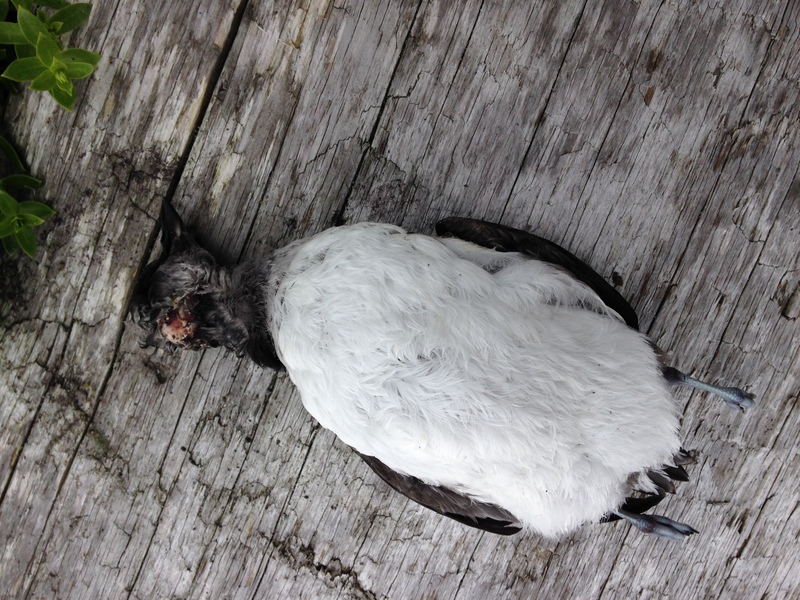 Bill color is dark, underiwng is white, with “dark stripe from wrist to wingpit.” Yep – Mottled Petrel! 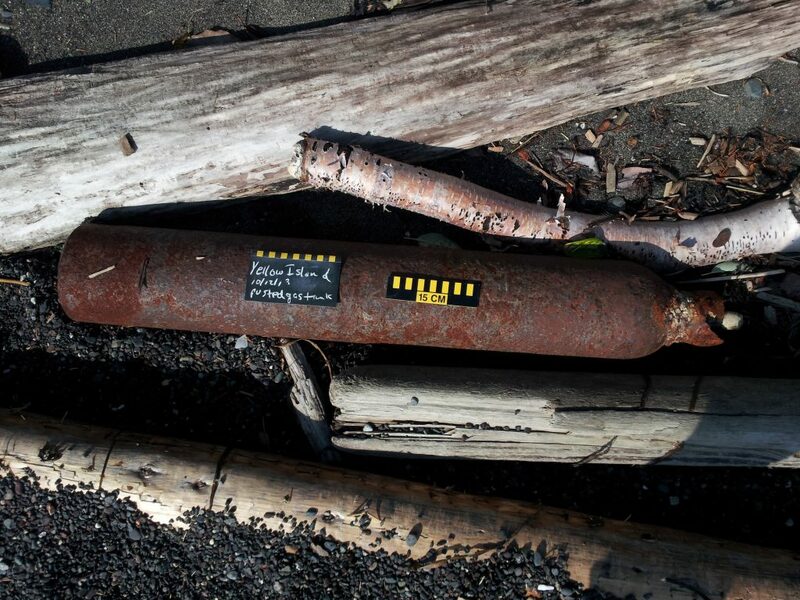 A gas cylinder found by Phil in the San Juans. Remember, if you find an item like this, do not touch or attempt to move. These items should be reported to the National Response Center by calling 1-800-424-8802 or visiting their website or to local law enforcement. 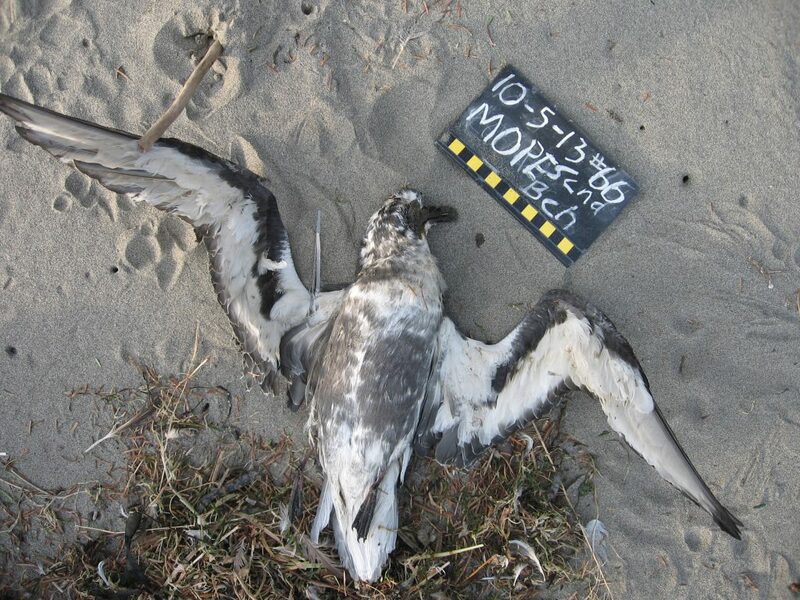 This entry was posted in Uncategorized and tagged Marine Debris, Seabird, Tubenoses, Waterfowl on October 31, 2013 by coasst. 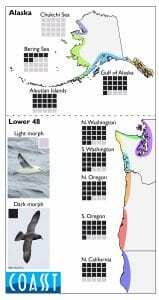 This entry was posted in Uncategorized and tagged Alcids, Field Trip, Larids, Perching Birds, Survey, Tubenoses, Washington on October 14, 2013 by coasst. Hope your week is off to a great start. With the fall weather upon us, now is a great time to check your COASST supplies and make sure you have plenty of rite-in-the-rain data sheets. Looks like there will be lots of rain in the future. 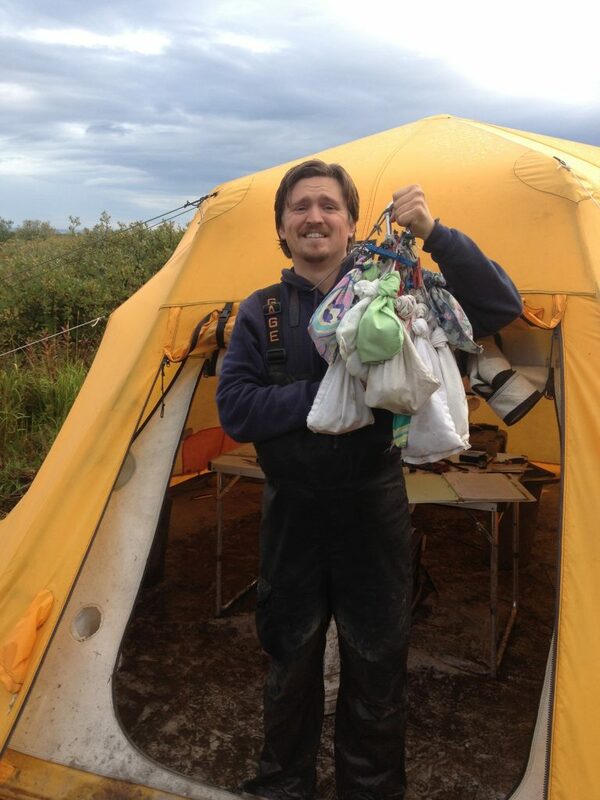 We are lucky to have such a great group of volunteers who face the cold and rain to collect these valuable data. 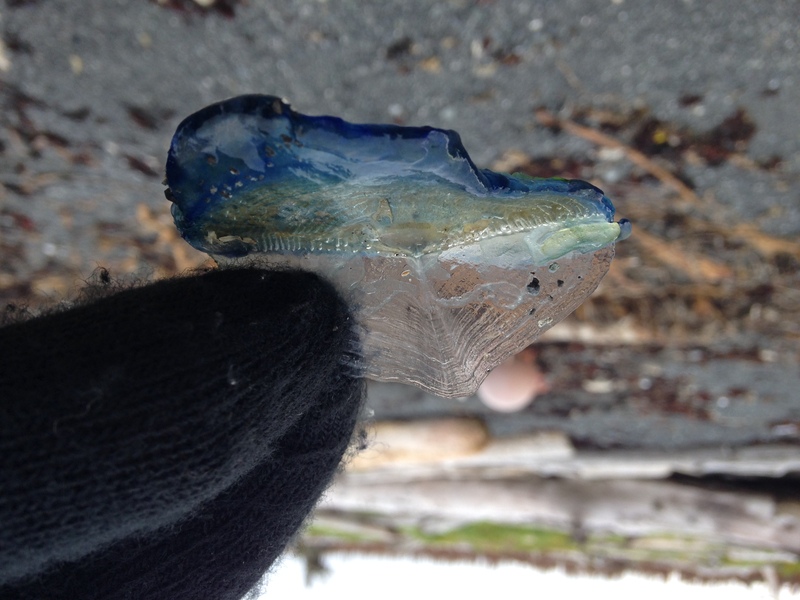 Here’s a look at a few of the many things found along our coastline in the last few weeks. 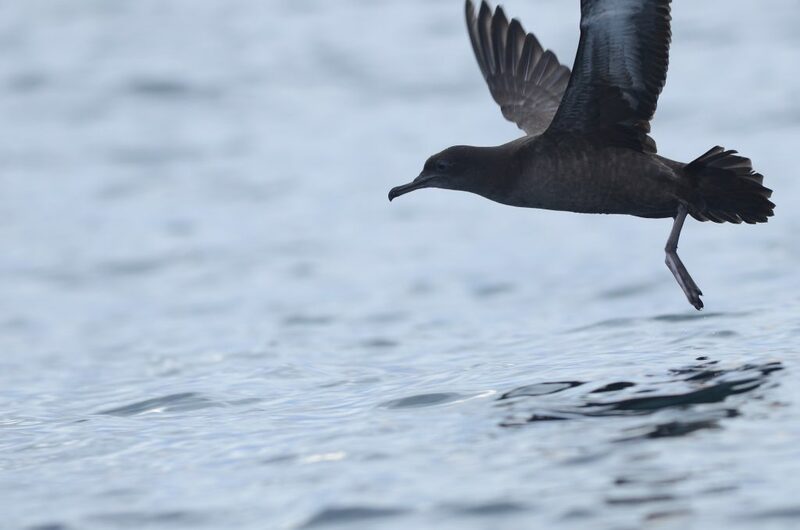 A Short-tailed Shearwater found by Ken in the Chukchi. Three webbed toes with a 4th minute (tiny) toe and flat heel puts this bird in the Tubenose: Petrels family. And a wing chord over 20 centimeters let’s us know it’s not a Storm-petrel. 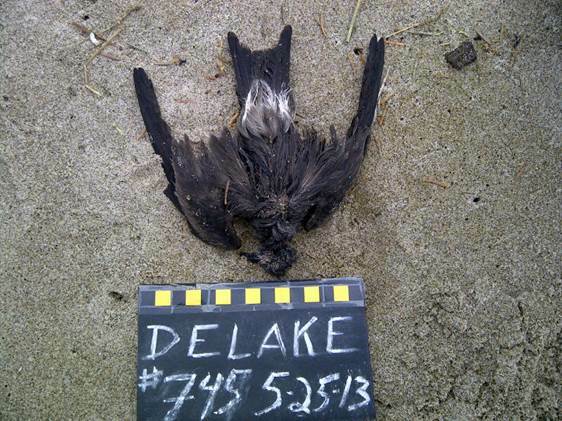 Using Beached Birds-Alaska, the dark bill points us to either Short-tailed Shearwater (TN5) or Sooty Shearwater (TN7). STSH generally have gray-to-brown underwings and a shorter bill, whereas SOSH have white-to-pale underwings and a longer bill. With a bill of 31cm, this is definitely a Short-tailed Shearwater. Using Beached Birds, look at the bill shape and tarsus. A thin and long bill and flat tarsus lead us to the shearwaters. We have three to choose from: Sooty Shearwater (TN5), Short-tailed Shearwater (TN7), or Pink-footed (TN15). We can rule out Pink-footed: mostly pale bill, white throat, belly, and underwing linings. With underwings that are more gray than white and a shorter (29-34mm) bill, this is a Short-tailed Shearwater. 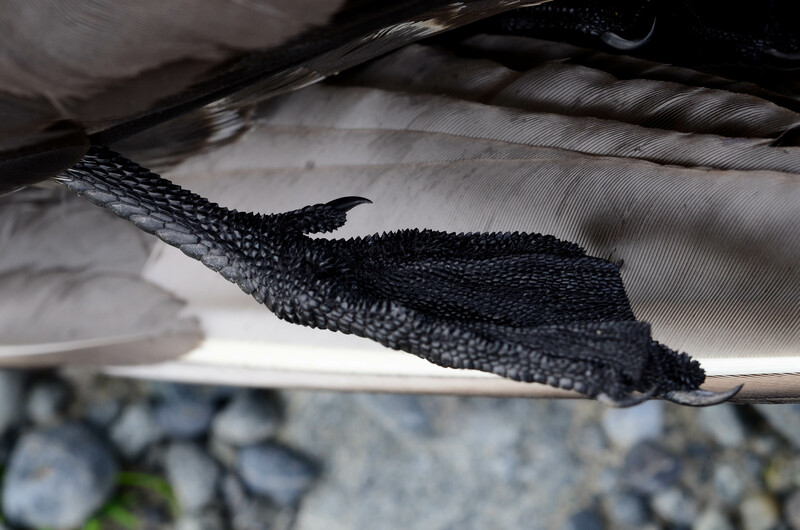 Great Blue Heron feet found by Stanley and Resha in the South Coast of Washington. Time for some practice with the foot key. Free toes send us to Q9. Three toes in front, one in the back sends us to Q10. None of the toes are fused – go to Q11. With a tarsus over 150 mm, four toes of the same length, and a comb-like nail on the middle toe, we’re looking at a wader. You’ll notice the “waders” label is in italics. This means Wader species are not part of Beached Birds, so we can’t go any further – writing “Waders” on your data sheet is just fine. An owl found by Cathleen and Daphne in the San Juans. Here’s another chance to practice with the foot key. This foot follows the same path through the guide as the wader, except a tarsus less than 150 mm will send us to Q12. With multiple claws and a feathered tarsus we’re looking at a Land Bird: Owl. 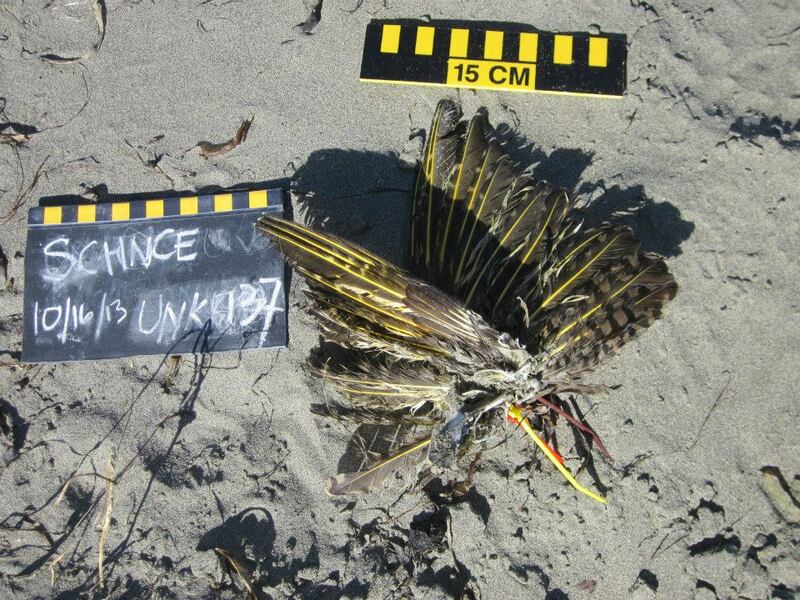 Again this label is in italics: no species profiles of owls are included in Beached Birds. A Northern Pintail found by Kathy and Lyn on the South Coast of Washington. Now for some practice with just a wing!If you are using the wing table, at 25.5cm this wing falls in the Med-Lg category. That iridescent stripe in the secondaries is called a speculum, giving us four options; Northern Pintail (WF9), Mallard (WF11), White Winged Scoter (WF3), King Eider (WF21). Out of these birds, the only one has a tan-dark-white speculum pattern, from leading to trailing edge: Northern Pintail, male.If you are using the west coast wing key, select secondaries contrasting and dark sending you to Q18. Then choose tan stripe above and white below secondaries. 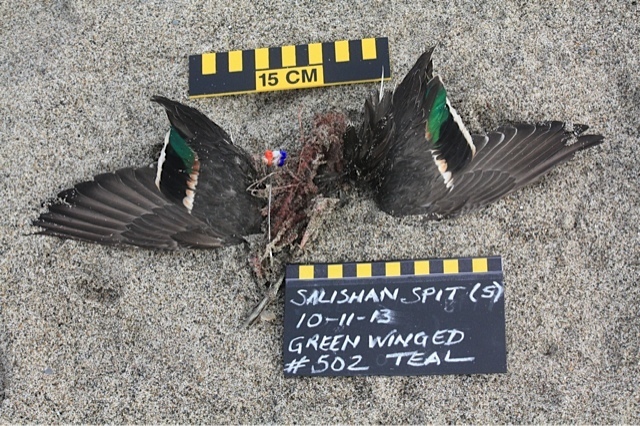 A measurement of 25.5cm is well above the range for Green-winged Teal.If you are using the Alaska wing key, select light or dark speculum and/or one or more white patches taking you to Q17. Here choose dark speculum, no patch leading to Q24. Speculum with buffy stripe above and white below gives you a Northern Pintail, male. A blue drum found by Heather in Oregon. 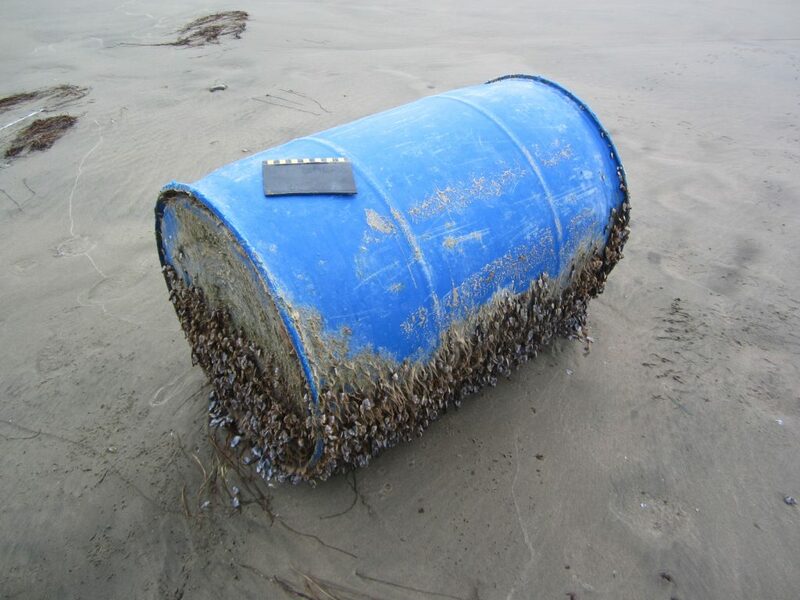 Drums like this one, found on the beach, can sometimes contain hazardous chemicals. If you find an item like this, do not touch or attempt to move. These items should be reported to the National Response Center by calling 1-800-424-8802 or visiting their website. 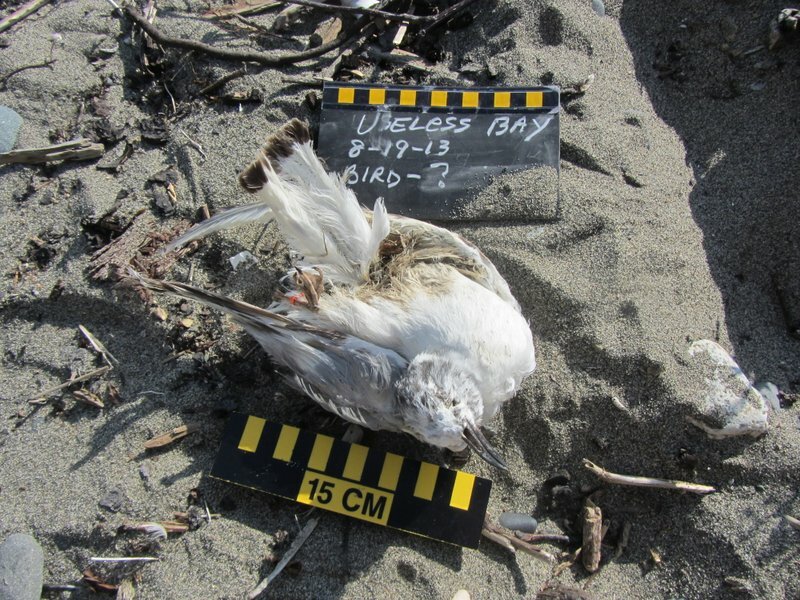 This entry was posted in Uncategorized and tagged Land Birds, Marine Debris, Tubenoses, Waders, Waterfowl on October 1, 2013 by coasst. A Black-legged Kittiwake found by BJ in the Gulf of Alaska. Leg color would be a dead giveaway for this bird, but we didn’t want it to be that easy for all of you! Let’s turn to the Alaska wing key: “gray mantle, some species with dark tips and/or stripes on mantle” (this has both, actually). We’re looking at a “broken diagonal stripe from wrist to elbow” and the secondaries are white, not black – wing chord of 30 cm means we have a Black-legged Kittiwake – immature. -Using the West Coast wing key? Choose gray upperwing, dark-to-black wingtips, and mottled stripe from elbow to wrist – that’s the Black-legged Kittiwake-juvenile (wing chord of less than 29 cm – otherwise it would be a Caspian Tern-juvenile). In North America, the Black-legged Kittiwake breeds in Alaska, and northeastern Canada, winters across the North Atlantic and North Pacific. BJ’s beach is right near one colony, nesting on the Homer ferry terminal. A Bonaparte’s Gull found by Candace in the Puget Sound. BOGU are just rare enough in the Pacific Northwest not to be featured in Beached Birds, only in Beached Birds-Alaska. Looks a lot like the Black-legged Kittiwake we just saw, but hey – did you spot the feet? Not black. Let’s turn back to the Alaska wing key: gray mantle, some species with dark tips, and that mottled upperwing stripe, but in this case secondaries are dark (see left wing). The wing chord also helps us out: BOGU=25-27cm, a little shorter than the BLKI. Live Bonaparte’s Gulls are normally seen in Puget Sound during their migration (Mar-Apr) to Canada and Alaska, though some stick around in small numbers throughout the winter time. A Black-footed Albatross found by Jane and Marilyn on the North Coast of Washington. Boy can we see the foot clearly on this one! Three webbed toes and a huge foot (tarsus >75 mm) puts us in the Tubenose: Albatrosses foot type family. From there, we choose between the only three albatross species in the North Pacific (22 worldwide): Black-footed, Laysan, Short-tailed. Dark feet, face, and neck rule out Laysan. Short-taileds change plumage from all dark to mostly white but have WAY huge (129-141mm! ), hot pink bills – see outline on TN20 or TN14(AK). A long-distance, ocean traveler, this bird likely calls MidwayAtoll, or Laysan Island home (73% of the world’s population lives in these TWO places), to raise chicks, winter-spring. A Common Murre bone refound by Tom in Oregon North. This bird was tagged on Tom’s first survey over a year ago. Recently, he refound the bone with the tags still in place. Note how the cable ties are tightened nicely around the right wing bone. Good tag placement ensures that COASST birds stay tagged and identified for remainder of their time on the beach: use the innermost wing bone, tie tight, clip tie ends! 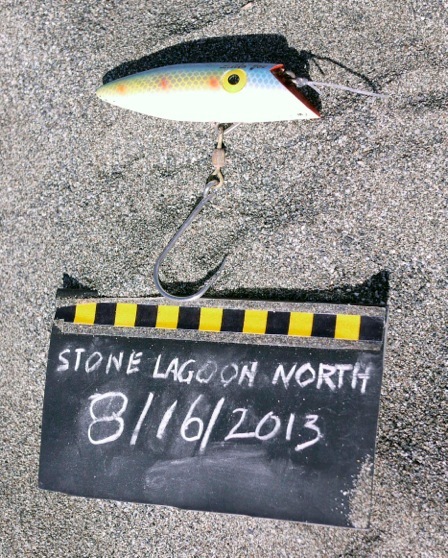 A fish hook and lure found by Joanna in California. 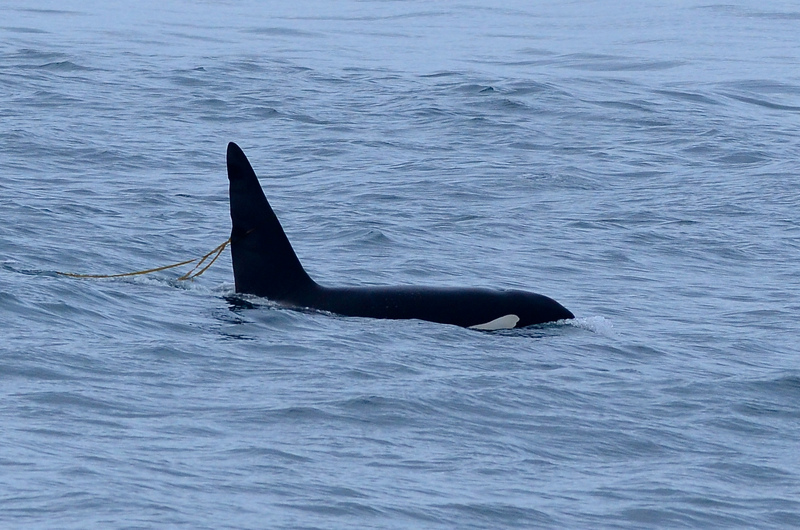 Hooks account for about 17% of the bird entanglements documented by COASST and are second only to fishing line. 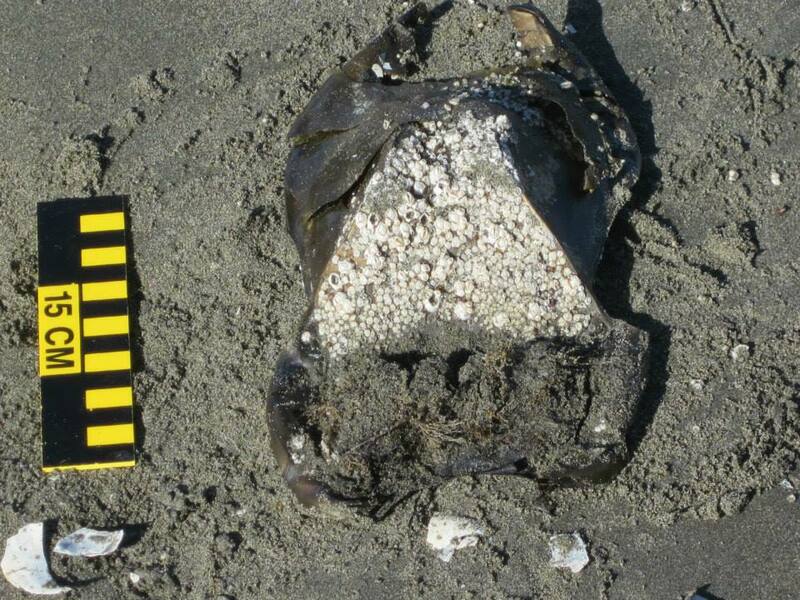 As we’ve mentioned before, if you see something like this on your beach, it’s best to pack it out. 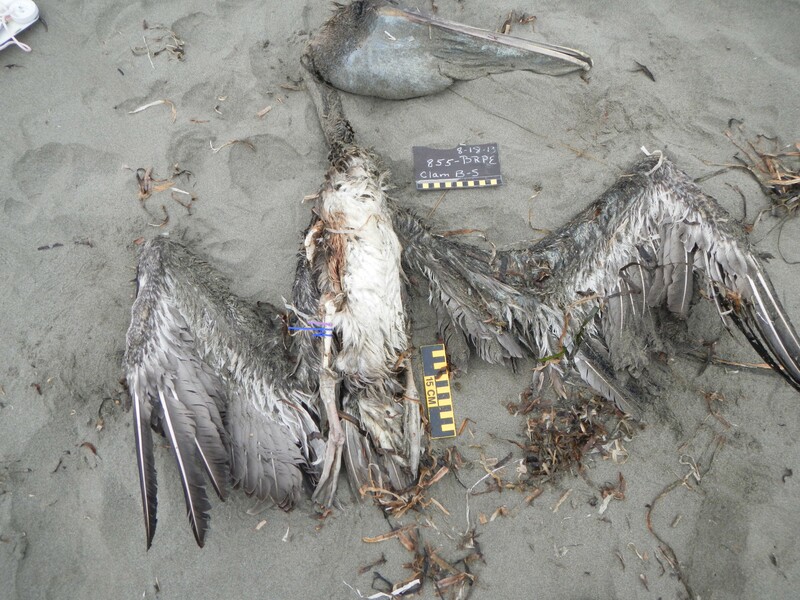 This entry was posted in Uncategorized and tagged Alcids, Larids, Marine Debris, Seabird, Tubenoses on September 9, 2013 by coasst. A Heermann’s Gull found by Jerry and Carol in Oregon South. Since the feet aren’t visible, let’s use the wing (sorry Alaskan’s – this one prefers south of 55°N). Our wing chord measurement is about 34cm, which puts this in the “Extra Large” category. Mantle is gray, wing tips are gray, so we have either a Glaucous-winged Gull or Heermann’s Gull – only one has a red bill with black tip – that’s the Heermanns’s. If you’re using the new wing key, select gray mantle, wing tips about the same color, no white trailing edge or windows in the outer half of the primaries. A Sooty Shearwater found by Linda and Dini on the South Coast, Washington. Three webbed toes and one tiny fourth toe (actually just a nail) – Tubenose! From the family page select dark, thin, long bill (and for Alaska – white underwing linings). 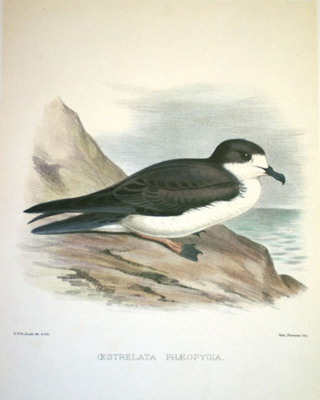 The bill size (39mm) rules out Short-tailed Shearwater (29-35mm). COASSTers surveying this area know we’ve seen a wave of SOSH this August. Drawn to the productive waters off the Columbia River, mouth of Grays Harbor, Willapa Bay and Tillamook Bay, Sooties are “tanking up,” about to make their journey south (WAY south) to areas off Chile, Argentina, Australia and New Zealand in the Southern Hemisphere. A Brown Pelican found by Terry and Kimberly in California. It’s hard to mistake this large bird! Four webbed toes puts it in the Pouchbill family and with a bill length of 34cm(!) it could only be a Brown Pelican. The head, neck and throat are brown; the breast white, so this is a juvenile bird (hatched January-June 2013 in Southern California or Baja California-Mexico). 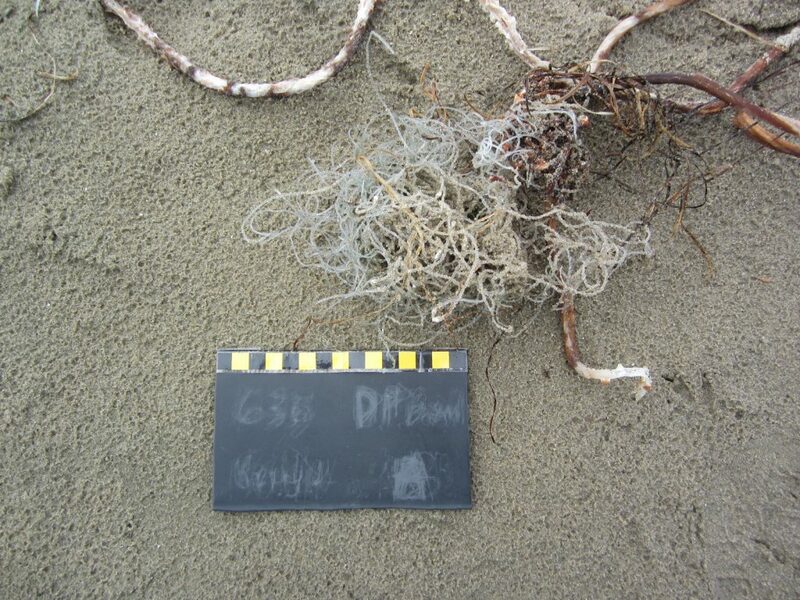 A ball of monofilament line found by Heather in Oregon North. Fishing line is the most commonly recorded type of entanglement on COASST surveys. 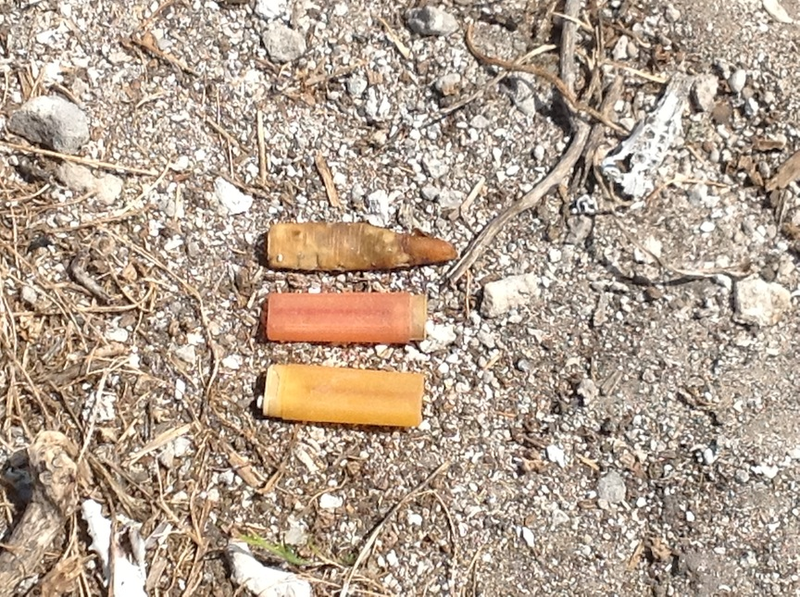 If you see some of this on your beach, it’s a good idea to clean it up. 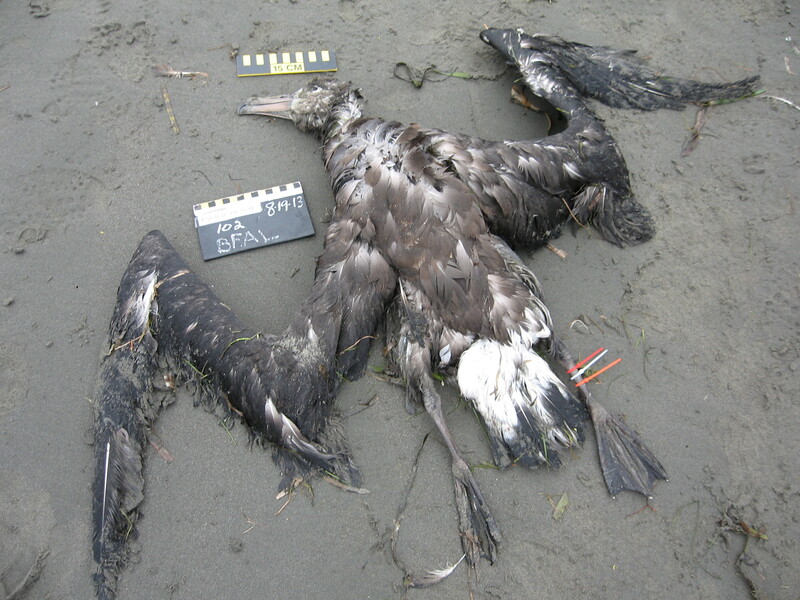 This entry was posted in Uncategorized and tagged Larids, Marine Debris, Pouchbills, Seabird, Tubenoses on August 27, 2013 by coasst. The West Maui Mountains between Kajakuloa and Makamakaole has historically been home to many breeding seabirds, but in recent years this population has been in steep decline. Habitat conservationists are hoping that next year they will begin to hear the songs of native seabird species in these hills again. Two bird enclosures are in the process of being built by First Wind, a Boston-based renewable energy company that operates the Kaheawa wind farms above Maalaea. The enclosures are for the endangered Hawaiian Petrel (uau) and the Newell’s Shearwater (ao). First Wind agreed to put the conservation plan together in order to offset potential impacts of the wind farms and ensure a “long-term net conservation benefit”. 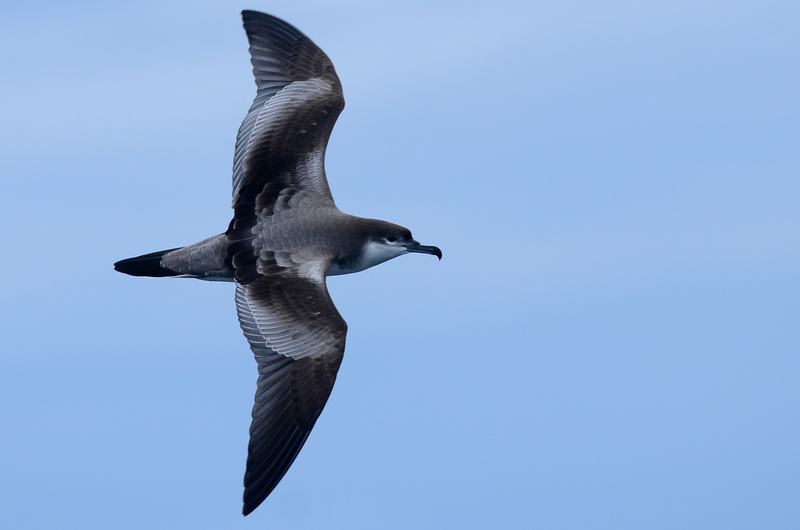 A Hawaiian Petrel, an endangered species that this project is hoping to help. The already installed shearwater enclosure has a predator-proof fence around 3-4 acres of breeding habitat. Many predators were trapped and removed and the fences will be checked each week for any breaches in security. Additionally, artificial burrows will be placed in each enclosure. The second enclosure will be installed within the next couple of weeks, and both enclosures are to be fully completed by fall. Why is there a need for these enclosures? Native seabirds were first driven to near extinction after early seafarers used the birds as food. More modern day threats mainly include introduced island predators. “We know that there are shearwaters here, but they’re being (preyed upon) by mongoose and cats,” said Steve Sawyer, president of EcoWorks New Zealand, which designed the enclosures for First Wind and has built similar enclosures on other Pacific islands. Sawyer brought two specialists with seabird detecting dogs to help search for remnant Hawaiian petrel burrows. 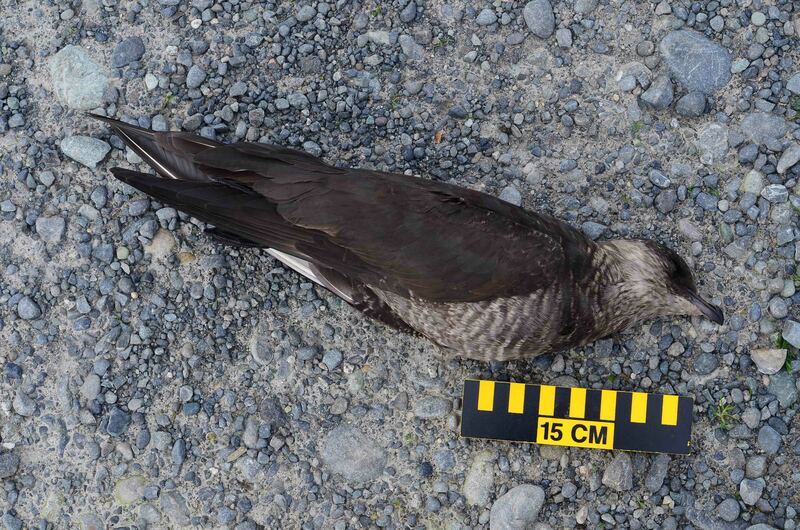 After weeks of hiking all over the mountain, the search team found only dead petrels. Attempts will be made to draw in the seabirds through the use of a solar-powered, weatherproof sound system that broadcasts recorded bird calls as well as the use of life like-decoy birds that were made by the same New Zealand company that created props for “The Lord of the Rings” movies. The enclosures will be kept in place indefinitely and biologists will monitor the project for the next 20 years. For more information and photos of the enclosures click here. 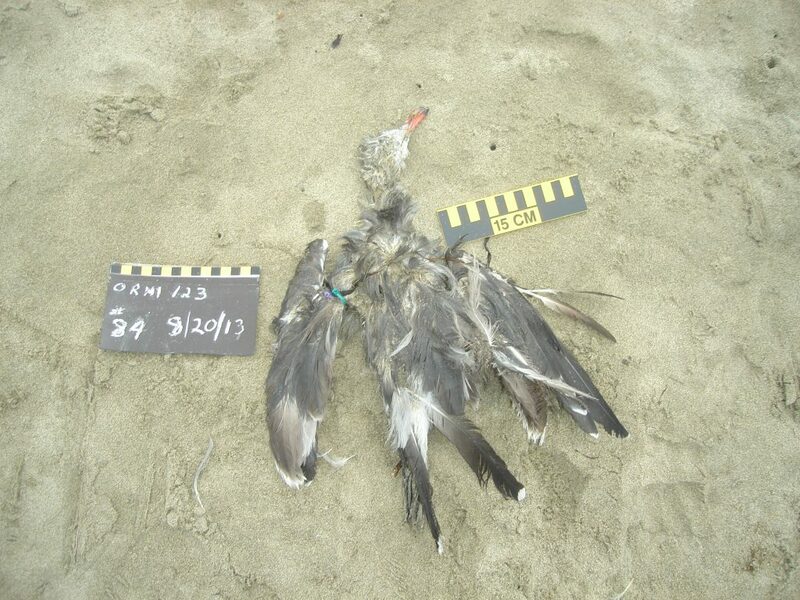 This entry was posted in Uncategorized and tagged Conservation, Hawaii, Seabird, Tubenoses on July 31, 2013 by coasst. The tiniest of tubenoses, this is a Leach’s Storm-Petrel found in North Oregon. All dark upperwing and a small wing chord of less than 18cm puts us in the “tiny” category of the West Coast guide, and a similar spot in the Alaska guide, one shared with many of the small Alcids (e.g., Marbled Murrelet, Cassin’s Auklet). Underwing linings are not white (you’ll have to trust us on this point) so we’re left with Storm-Petrels. 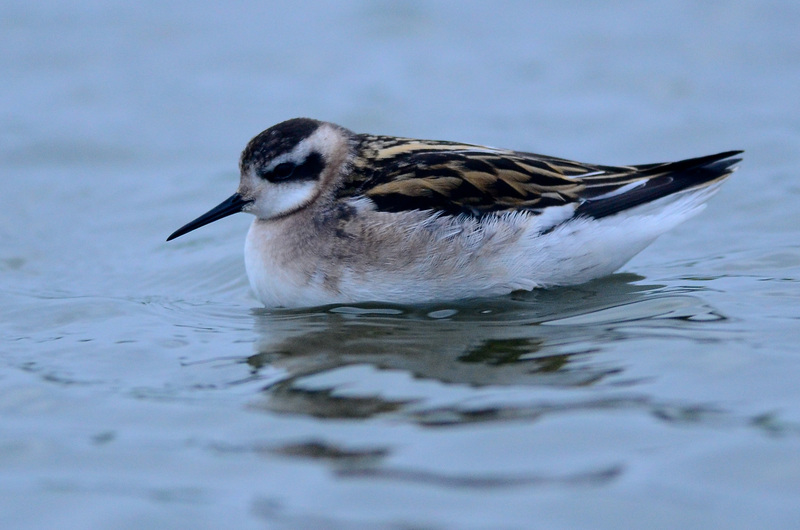 Of those, only the Leach’s has a white rump and dark brown (vs. light gray) plumage. 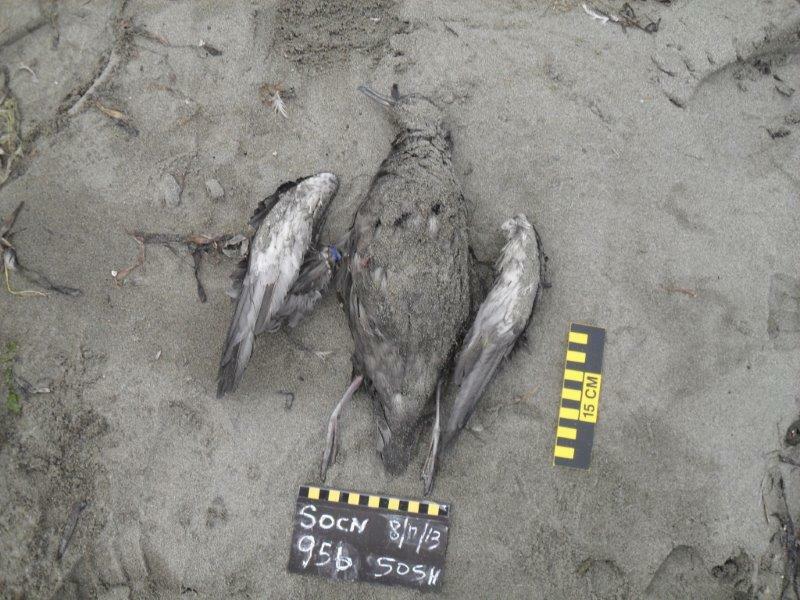 A Large Immature Gull entangled in blue filament (see left leg) found in the Puget Sound. Entangled birds make up about 0.5% of all birds found during COASST surveys in any year. Look carefully at that bill – dark and hooked, but no tube or separate bill plates, so it’s not a shearwater or a jaeger. 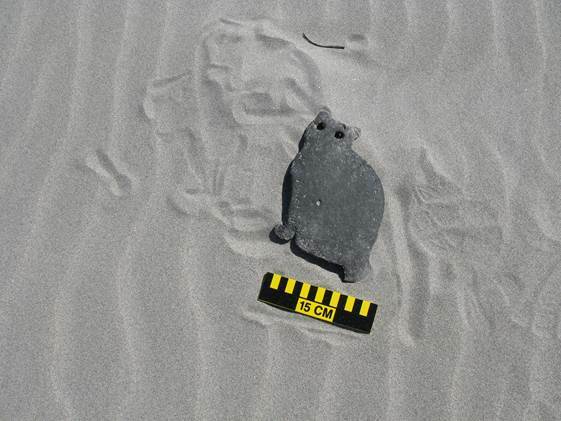 A rubber cat found on the South Coast of Washington – perhaps used as an under-pet-bowl placemat? 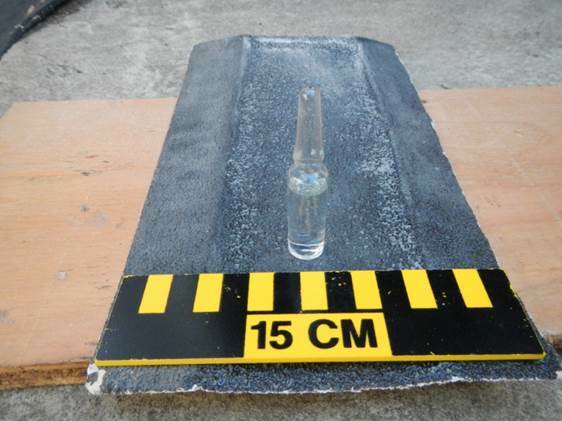 Finally, a glass ampoule (sealed vial) found on the South Coast of Washington. Modern ampoules are mostly used to contain injectable pharmaceuticals. The best way to dispose of an item like this and other medications is through a local pharmacy, or National Prescription Drug Take Back Day, or via the FDA’s suggested method. You never know what you may find out on those beaches! 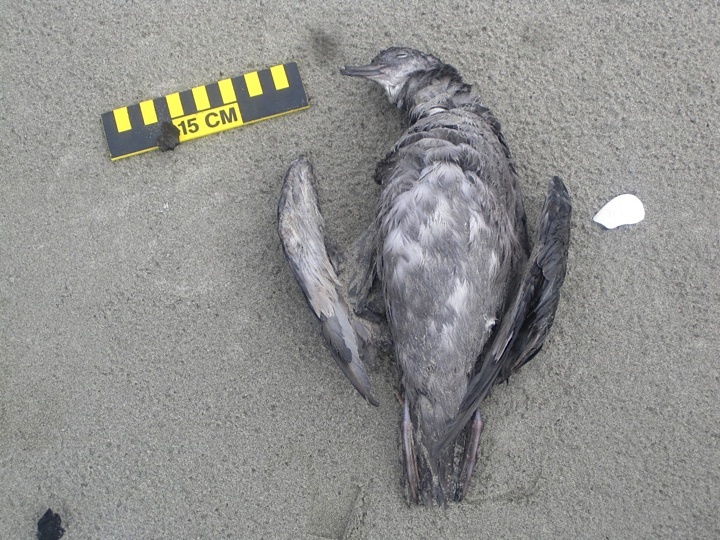 This entry was posted in Uncategorized and tagged Alaska, Chukchi, Larids, Marine Debris, Oregon, Puget Sound, South Coast, Tubenoses, Washington, Waterfowl on July 8, 2013 by coasst.